You're a sports fan. You know that The Derby is a big deal, only because you have always been told that it is really important. But what's the big deal? You don't really get it - to you it's just a horse race like any other, because no one has ever taken the time to explain to you WHY it is so celebrated by the horse racing masses. That's where I come in. The 1st 2nd 3rd 4th 5th 6th of several installments. Like The Masters, this is a blue-blooded Southern tradition. Unlike The Masters, the Derby is all about equal opportunity for women. 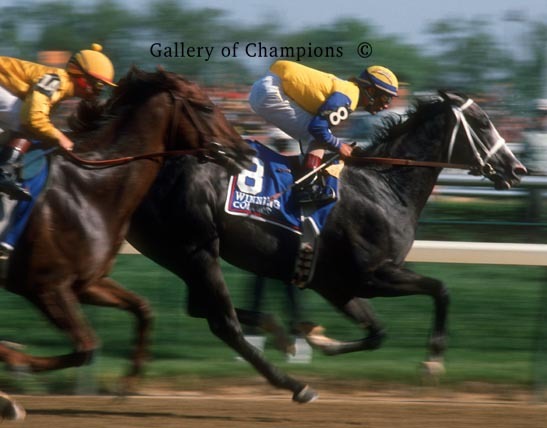 The Kentucky Derby is a race for 3 year old colts (male horses) and geldings (male horses sans maleness) that is run the first Saturday of May each year. The day before is The Kentucky Oaks, a race for 3 year old fillies (female horses). Colts and geldings cannot run against the girls in the Oaks, but any filly is welcome to try her luck against the boys in the Derby. She even gets to carry 5 less pounds on her back, 121 lbs. to the 126 carried by colts and geldings. This usually happens about once every 5 years or so: a 3 year old filly is so dominant that her owner/trainer think that she can take on and beat the bigger stronger 3 year old boys. The risk is that if your filly is that dominant, then you are passing up $500,000 for presumably winning the Oaks and instead running against the 19 boys for a shot a the now $2 million purse; but money is only awarded for finishing 1st - 4th; finish 5th or worse and you earn zilch. 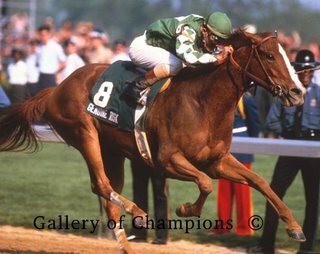 A filly has entered the Derby I believe 40 times, and three times has won (Winning Colors 1988, Genuine Risk 1980, and Regret 1915). The best filly I have ever seen since getting into racing in the early 90s was Silverbulletday, who chose the safe route in 1999 and won The Oaks as the 1-9 favorite. I think she could have won the Derby, but even so it was a gamble that owner Mike Pegram decided not to take. The Derby is open to female owners, trainers, and jockeys as well.